Wednesday, May 30, 38 k ride. The telephone rings at 6:00 am; my alarm hasn't gone off yet, so I'm a bit dumb on the phone. It's Terry, checking in from California. We chat a bit. I mention to her the thunder I've heard in the middle of the night, and Terry checks the web for Damascus and Beirut weather. "93 degrees Damascus and 87 degrees Beirut," she reports. "No rain; clear for the next few days." When the phone call is over, I get out of bed, open the curtain to let in light, and see that everything is wet-it's been raining while I've been getting a no-rain weather report from the other side of the globe! It's not a heavy rain-some folks aren't using umbrellas-but nearby roof puddles confirm that it's been raining for a while. Damn! How does this impact my plans? I can stay in Damascus a second day, like Lonely Planet would expect me to, perhaps visiting a museum or two, or I can take a shared taxi directly to Baalbek, or I can wait till the weather clears up and maybe take a shared taxi part of the way. I have breakfast in the hotel lobby and return to the room to make sure that my stuff is as waterproofed as possible. The drizzle stops and the roads start to dry. I'm outta here! Yesterday I had walked to the private car compound and today, with the bike, it's much quicker and easier to find. My maps and homework have paid off. 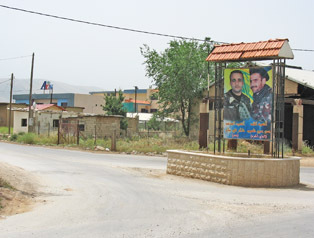 I know I want to go to Chtaura, just over halfway to Beirut, or possibly the village before Chtaura, Barr Elias. This taxi area seems to be a collective. Instead of the bidding war for my business, there seems to be a slight bidding war, then a quick agreement on who gets me. I am quoted 1,000 Syrian Pounds or $20, apparently a double-rate, because of the bicycle. The bike and bags are tossed in the trunk, I'm asked for my passport, and then there is something about me paying 1,500 Syrian Pounds and having a private vehicle. I demand my passport back and we again come to agreement - 1,000 Syrian Pounds. Maybe 15 minutes later we have three more passengers and we are on the road. It's 8:30 or 9:00 in the morning; I'm not sure. I grill the driver about accommodations along this route, since my plan is to bicycle back this way, dropping south before I get to Damascus. Soon enough we're at the border, where we're first processed by Syrian customs. Our driver accompanies us in, and is very helpful in pointing out which line I belong in. (Nothing's in English and the three passengers I'm traveling with go to a different queue.) I notice that little 50-Pound Syrian notes ($1) seem to quietly accompany almost every ID presented to the counter-staff. 3-15 days: 15,000 Lebanese Pounds. 16-30 days 25,000 Lebanese Pounds. "Visas must be paid for with Lebanese Pounds." The 48-hour transit visa sounds good because I can't even remember if 15,000 Lebanese Pounds is cheap or expensive. It looks like that booth in the room's corner may be a currency exchange service, but things are moving fast. I indicate to my driver/facilitator my lack of Lebanese Pounds and he indicates "No problem." I'm at the front of the line now, and a not-quite friendly Lebanese visa official asks how long. I say "Two and a half days, maybe 50 hours," then make a sleeping motion and indicate two nights. "Two night, OK, transit visa." Cool. I've just saved myself 15,000 LPs. (Only later do I realize that I've limited my options for an $11 savings.) As we pull away I spot a Dunkin' Donuts on the other side of the road, I guess in the Lebanese duty-free area. Go figure! As we drive, something's changed. There are more roadside businesses, and everything looks more… prosperous. Interesting, in that Lebanon's been and out of civil war for decades. We pull over, and two of the passengers get out. 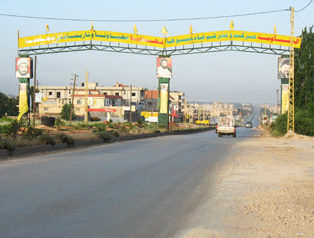 A short while later the driver pulls over and points out side road saying "Baalbek". A road sign says the same thing, so perhaps this is Barr Elias. I hope that I'm about to take the better of the two routes north. 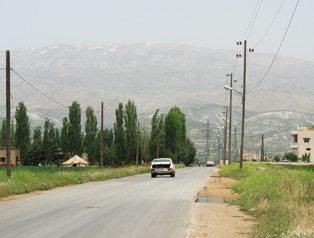 I ask the driver about the ride to Rayak, the point where this road joins the main road to Baalbek, and the driver indicates that this route is shorter. I ask about the road surface, touching the ground, and the driver indicates "Same". I gesture "Hills?" and the driver says "No." So be it. I get out, pay the $20, and add a tip. The driver's quite happy. So am I. The cab pulls away, and I start to attach bags to the bike. A few meters away, four Lebanese men are watching closely. 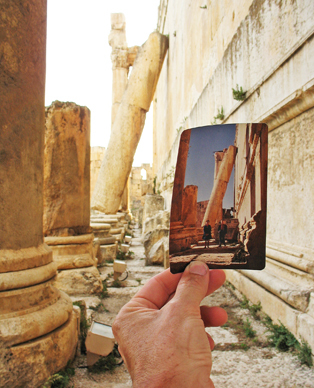 I say "Hello," point up the side road, and ask, Baalbek?" They nod. It's 10:52 am, and I'm biking. This is some of the nicest scenery since early Turkey. The road is quite smooth, except for these meter-wide pot holes that could destroy a truck. Area on either side of me is green farmland. I approach my first military checkpoint, complete with speed bumps, sandbagged pillboxes and barricades, but it's unmanned. Off to the west I notice what looks like a Vietnam era Huey helicopter cruising low and slow. I am separated from the coast and the current fighting by 50 kilometers, and a small coastal range. That should be fine. I come to an intersection that's not on my map. I stop and use the digital camera to photograph this intersection, thinking that this might help me find my way back. A man comes over and says hello. I inquire about Baalbek and am told to take a left when I come to a traffic circle, then a right at the next big intersection. I follow the directions, and find myself at the point where I'm joining a larger road. Baalbek's got to be to the right, but I confirm it at the gas station on the other side of the street anyway. I also take a picture of this intersection; so that there's no way I can miss it on the ride back. This must be the main north-south road, that I would have been on, had I started in Chtaura. The surface is a combination of fresh, high-quality asphalt and torn-up construction area, with traffic squeezed together, excessive horns, dust, etc. The ride north seems to be a slight uphill climb, which means that my return, especially if I get started before the traffic does, should be a nice ride. I stop for a soda at a storefront. I'd been told back in Damascus that Syrian currency and US dollars are just as accepted as Lebanese pounds. Although the woman takes Syrian, she doesn't seem thrilled by it. The road workers taking a break outside ask me where I'm from, and I detect a bit of an edge when they learn that I'm American. Riding on, I enter the town of Baalbek. 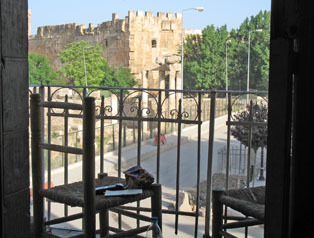 On the Lebanese transit visa I had put my accommodation as Palmyra Hotel, since the guidebook recommends it. I pull over, since I can't find it, and a young man comes over and points a hundred meters behind me. The hotel's right on the main drag and I'm concerned about traffic noise and horns, so I ask my new friend, Audi, where Hotel Shouman is. I don't get a clear answer. I ask him where an internet café is. He points and we are start to walk. We're walking, and walking, and I have to interrupt: "First hotel, bicycle is heavy." We u-turn, go down a torn-up side street, and there's the hotel, not far from where we first met. We go up the stairs. The manager asks if I want a dorm or private room. I say "Private" and he shows me a room with three beds right off of his reception area. It has a balcony and is directly across the street from the ruins and he proposes $17. I agree. My new fried Audi seems inclined to hang out, so I indicate that I must shower first and perhaps he should come back in a half hour, at 2:30 pm. He agrees and leaves. I go to the storefront downstairs, buy a soda, come up, strip for a shower (Hey - Hot water!) and have to dress again to chase down my hotel manager to get a towel. Showered, I joined up with Audi and start walking again. He says he is hungry, which works for me, and we go to this very nice café on a freshly cobble stoned side street. The street's got a very yuppie feel, though business is dead. Perhaps 50 meters away he points to a construction site and says that there was a building there, but the Israelis bombed it last year. Wow. I didn't know that the town of Baalbek was a target. We enjoy a great western style pizza, then start walking. After ten minutes I ask where we're going. "Gardens", he replies, and we continue walking. Walking to some sort of gardens after having biked a couple of hours, plus his awkward sense of personal space (he keeps bumping into me) frustrates me and I speak-up. "Ruins," I say. We walk a bit further, then he points across the street to a ruin of some sort and says "Library." We cross over to an entrance next to the ruin, where two guys inspect the contents of my pannier, then let us pass. We are now inside an outdoor museum dedicated to Hezbollah, an organization known for it's anti-Israel agenda, and also associated with the bombing of the Marine barracks back in 1983. To enter the compound we have to walk across an Israeli flag. Inside are displays of war memorabilia together with pictures of Hezbollah martyrs. This is interesting, and probably not in the guidebooks. We walk back. He points-out his favorite internet café. He suggests that tomorrow we take a bus to Beirut, where apparently his family lives, and at first I'm intrigued, but then reconsider. My visa gives me only two nights in Lebanon, and I'm not sure how much time the ruins here are worth. I decide to check my email, and Audi breaks away, saying that he'll look for me later. After a short stay at the internet café, I walk back to the hotel and pay the $8 entrance fee to the ruins. I'm told that the place closes at 6:30 pm, about an hour and a half from now, but that I can stay on the grounds for as long as I want. I'm carrying a photo from a photo album my father assembled for me years ago. The picture is of my sister and I in front of a leaning column. The picture was labeled "Balbek," and would have to have been taken back around 1965. I'm 6 or 7 in the photo, and I don't remember it. I ask where the leaning column is, and show the attendant the picture. He points on the map, at the far side of the Temple of Bacchus. 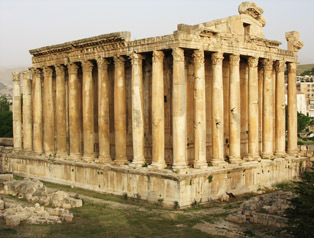 Here at Baalbek the site to see is the Temple of Bacchus, also known as the small temple. It surely isn't small. If anything, it may be the largest complete ruin around-I don't know. I find the leaning column. I have no photographer available and the light's very different; apparently the last time I was here it was morning. Nevertheless, I take a few shots. I wander back to the other side, well lit by the setting sun, and take a few photos. Then I sit down and make myself comfortable, just soaking up the scene. The grounds are empty. As it gets darker, I move towards what I believe to be the exit tunnel, spotting the first people in over an hour. I enter the long and increasingly dark tunnel and the door at the other end is locked. Boy, now I'm not glad I'm alone here… I return the way I came and one guy says: "Museum closed." I look for another exit and find one - popping me right out by the entrance. There, in the near dark, are the same Hezbollah T-shirt vendor and the antique coin guy that approached me when I went in. The $12 t-shirt drops in price until it is $4 and I can't say "No". I do pass on the coins however. I wander around the small town. High above the other buildings I spot the large, brightly lit deck of Scheherazade Restaurant, referenced in LP. I find the building, take the elevator up six floors, and take a look. It's big, yet there's not one customer. This is awkward; I don't want to eat food that's been sitting. I mumble something about coming back for breakfast, and slip away. Wandering back toward my hotel, I spot an active shwarma stand and manage to get one without pickles. I stop by a mini-market, buy a soda and call it a night. 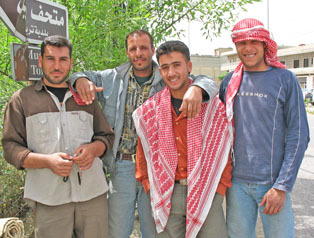 The guys at the Baalbek turnoff.. It's a nice country road, but with potholes that could break a truck's axles. Snow up in the hills amused me, since it was plenty warm where I was..
With a picture of this intersection, there's no way I'll miss it on the way back. Yellow, green and red: the colors of Hezbollah. My private balcony overlooks the ruins! 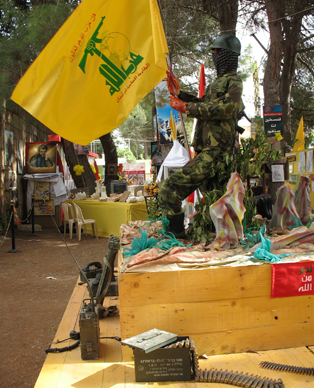 The Hezbollah Museum. This island displayed captured Israeli gear. Holding the 1965 photo. Yep - Not much has changed in 42 years.